A healthy food warrior himself, Swift knows the products inside and out, and he gave me an awesome tour of the company’s offerings. He clearly demonstrated why plants provide the cleanest and healthiest protein options, along with their antioxidants, vitamins, minerals, enzymes, and phytonutrients. We came across Orion because he purchased 500 Hutchco Easel Back Sign Holders. When I wrote him to invite him to participate in our 15 Minutes of Fame, his genius as a marketer popped right out of his email response. 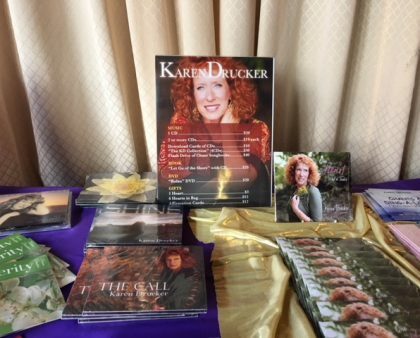 He wrote, “We use our easel back signs as dry-erase boards, and to hold various messages on our live demo tables across the country. They also go on top of our shipper displays.” He made his email worth a thousand words by attaching a photo of the Hutchco Easel Back Sign Holder in use as a dry-erase sign. “One of our salespeople commented that it would be nice to have a blank sign that customers could write on. Having a background in the music industry, tour flyers popped into my mind. Obviously, it worked. 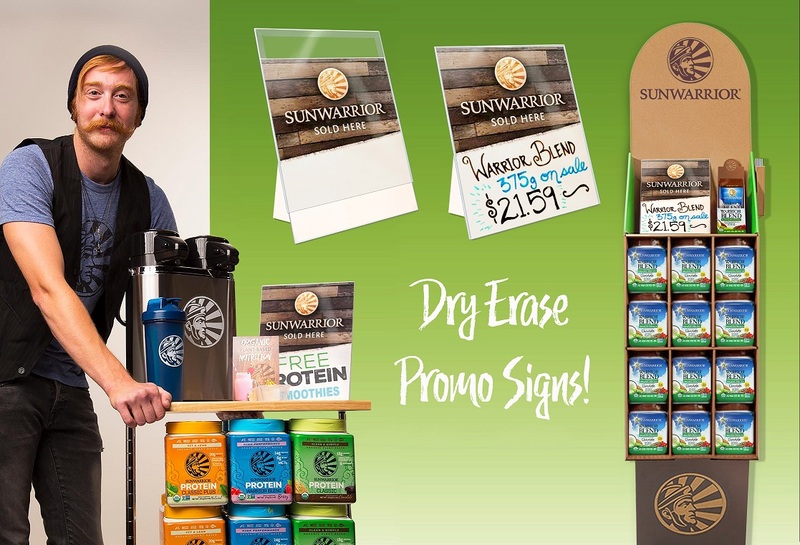 And that’s how Sunwarrior’s dry erase promotional signs became an important part of the company’s in-store marketing assets. They send one out with every product display. We ask all of our 15 Minutes of Fame interviewees to describe what is special about their workplace, and Swift had no problem answering the question. Denley Fowlke and Nick Stern developed their vegan plant-based protein because they simply could not find an existing protein powder that met their own health quality standards. Listening to Orion talk about Sunwarrior products, it’s obvious that he and his co-workers truly believe in the cause to provide consumers with high-quality vegan plant-based protein. He answered every question like a practiced and trained warrior himself. After listing to his pitch, it was difficult to image a better quality product for people who care about their health. I’d like to thank Orion Swift for his enthusiasm when I asked him about his purchase and invited him to our 15 Minutes of Fame interview. Listening to a Hutchco customer talk about their experience with passion and clear, well-founded facts makes our work at Hutchco more exciting. 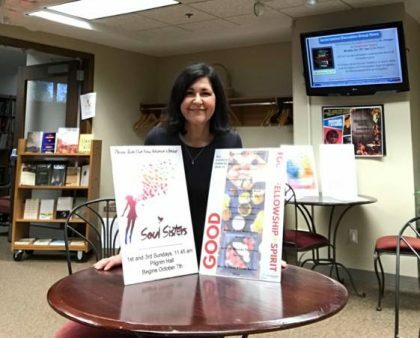 In addition, hearing about how he turned our plastic Easel Back Sign Holders into inexpensive, easy-to-ship dry erase signs for Sunwarrior’s product displays inspires me to learn more about our customers who purchase our products. Thanks again, Orion, for a wonderful interview and for sharing your idea with us!